c.600 AD On the east side of Toome Hill (Toomemägi), a fortress was erected - Tarbatu. It was located in approximately the same area where the Astronomical Observatory now stands. 1030 The Kievan prince, Jaroslav the Wise (c.978-1054), raids Tarbatu and builds his own fort in its place, which was named Jurjev. The description of these events in an ancient Kievan chronicle is the first mention ofTartu in written sources. 1061 Estonians retook the fort. 1224 The German Brethren of the Sword captured Tartu. Tartu became a bishopric. 1262 The army of Prince Dmitri of Novgorod (c.1250-1294) – the son of Alexander Nevski (1221-1263) – launches an assault on Tartu, capturing and laying waste to the settlement. However, the Russians did not manage to capture the Bishop’s Fortress on Toome Hill. After the devastatio, a stone wall was built around the lower-town of Tartu, stretching for a total of about two kilometres. The destruction wrought by the Russians is recorded in Russian and German chronicles, which mention that, alongside the bishop’s fortress, a settlement of German merchants and artisans had arisen. 1280s Tartu joined the Hanseatic League. In medieval times, Tartu was an important merchant town. 1525 The German Lutheran reformation reaches Tartu, accompanied by surprisingly violent desecration of the churches (the furnishings of the Diocesan Cathedral on Toome Hill were also destroyed). Some inhabitants even make preparations to attack the bishop’s residence. Before the Livonian War (1558-1583), the population of Tartu was approximately 6,000. 1558 The armies of Tsar Ivan the Terrible (1530-1584) attack at the start of the Livonian War. The town and bishop’s palace surrender without resistance to the Russians. The Bishop of Tartu is taken to Moscow and imprisoned there. It is the end of the Bishopric of Tartu and others medieval Livonian minor states. During the next few years Poland, Sweden and Denmark enter the conflict for the access to Old Livonia. 1582 The Jam Zapolski Peace Treaty. Tartu became part of the Polish-Lithuanian Commonwealth. 1583 A Jesuit residence was established in Tartu. The Polish King Stefan Báthory (1533-1586) gave Tartu its red and white flag. 1600-1629 The Swedish-Polish war for Livonia. 1600-1603 Tartu was under the rule of the Swedish King. 1603-1625 Tartu fell to the Poles. 1625 Tartu changed hands again and became a Swedish possession. 1631 The first Printing House was founded in Tartu. 1632 King Gustavus II Adolphus of Sweden (1594-1632) founded the University (Academia Gustaviana). 1656-1661 The Swedish-Russian war. 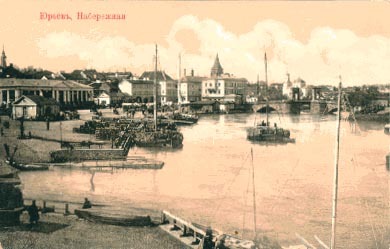 The Russians held Tartu during these years. 1684-1688 Near to Tartu, the first teachers’ training college in Estonia was established, the so-called ‘Forselius Seminary’. 1704 Tsar Peter the Great (1672-1725) personally leads the Russian forces in their conquest of Tartu during the Northern War. 1721 The population of Tartu was as low as 21! 1708, 1763, 1775 Great fires in Tartu. The medieval architecture is extensively destroyed, after which Tartu is rebuilt in a late-baroque and classical style. 1789 The population of Tartu was 3,421. 1802 The University of Tartu was again opened by permission of the Russian Tsar Aleksander I (1777-1825). The population was approximately 3,500. 1854 The population of Tartu was about 13,000. In the second half of the 19th century, Tartu became the centre of Estonian cultural and national life during the national awakening of the Estonian people. 1869 The first song Festival was held in Tartu. 1870 The first Estonian national theatre, the ‘Vanemuine’, is established in Tartu. The first original Estonian comedy is performed: Lydia Koidula’s "Saaremaa Cousin". 1872 The founding of the Society of Estonian Writers. 1900 The population of Tartu was more than 40,000. 1905-1907 Political and social unrest lead to a revolution which was brutally repressed. 1909 The Estonian National Museum was founded in Tartu. 1917 In late autumn, Russian-minded Bolsheviks come to power in Estonia. 1918 On the 24th February, publication of the Estonian Declaration of Independence. February 1918 to November 1918 The territory of Estonia is occupied during the First World War by German forces. The Germans leave soon after a revolt and the peace agreement between the Entente powers. End of November 1918 The forces of Soviet Russia enter Estonia. The new Estonian Republic organises resistance to the invasion. The Estonian War of Independence begins. December 1918 to January 1919 Soviet Russian forces hold on to occupied Tartu at the height of the War of Independence. Estonian soldiers arriving in an armoured train take the town in a fierce battle on the 14th January 1919. 1919 On the 1st December, the University of Tartu reopened with tuition in the Estonian language. 1920 On the 2nd February, Estonia and Soviet Russia signed the Tartu Peace Treaty. Russia renounced territorial claims to Estonia "for all time". 1920 On the 14th October, Finland and Soviet Russia signed a peace treaty in Tartu. 1932 An Estonian-Russian treaty of non-aggression was signed. 1939 On the 23rd August, Soviet Russia and Nazi Germany signed a non-aggression pact which contains secret protocols giving the Baltic States to Soviet Russia. 1940 In June, the Red Army occupied Estonia. Estonia was annexed to the Soviet Union with the help of collaborators. 1941 On the 14th June, almost 10,000 Estonians were deported to Siberia. 70 % of these were women, children and the elderly. At the end of July, Tartu was invaded by the Nazi Germany Wehrmacht. 1944 The Soviet Union occupied Estonia. 1949 The population of Tartu was about 57,000. 1949 On the 25th-26th March, tens of thousands of Estonians were deported to Siberia. 1950 The population of Tartu was about 55,500. 1977 The population of Tartu reached 100,000. 1986/87 The second awakening of the Estonian people began, centred in Tartu. 1988 The Soviet Union breaks up. The citizens of Tartu bring out the Estonian national flag again. 1991 The Republic of Estonia is re-established. 1992 On the 20th June, The new Estonian currency (the Kroon) was put into circulation. 1993 The Russian air force leaves Tartu. 1993 During autumn, the Estonian Supreme Court was re-established in Tartu. 2016 The main building of the Estonian National Museum was opened in Tartu. It was the largest project to be undertaken in an independent Estonia.